Casa Padrino offers in the luxury hotel bar stool collection very high quality and imposing seating for your hotel lounge or bar. All pieces of furniture in this collection are made from the finest and highest quality materials to ensure the highest quality standard for your needs. Your guests will simply be amazed by the quality of these exceptional bar stools. The very comfortable and luxurious bar stools in gastronomy quality decorate your home bar pompous and stylish and guarantee to be a real eye-catcher. 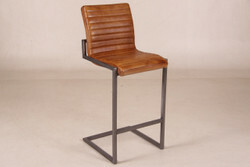 Your guests will love the luxury hotel bar stools. Our barstools consist of e.g. made of solid wood, polycarbonate, acrylic and metal. Idealism and passion are very important at Casa Padrino. If you have questions regarding our offers, please call us on the hotline + 49-201-36577485 and our qualified support will help you in every detail! Guaranteed! Casa Padrino, your baroque wholesale on the internet and on site. You would like to set up a hotel, restaurant, beauty salon or hair salon and need a variety of furniture? Are you planning a project for a big event or fair? Are you an interior designer, architect or exhibition organizer and would you like to purchase a large number of our products? You own a castle, a castle or a large villa and would like to furnish it with furniture from Casa Padrino? Contact us! We will definitely make you an attractive offer.